Dr. Gina Gillie is an Assistant Professor of Music at Pacific Lutheran University where she teaches horn, aural skills and music appreciation courses, conducts a horn choir, and performs frequently with faculty groups and in solo and chamber recitals. As an orchestral player, she is currently Assistant Principal with the Tacoma Symphony and has also played with the Pacific Northwest Ballet Orchestra, Northwest Sinfonietta, the LaCrosse Symphony Orchestra, the Central Wisconsin Symphony Orchestra and the Beloit-Janesville Symphony Orchestra. She is a member of two faculty chamber ensembles at PLU, the Camas Wind Quintet and the Lyric Brass Quintet. In 2006, she attended the Tanglewood Music Festival as an orchestral fellow where she worked with world-class musicians such as James Levine, Elliot Carter, Bernhard Haitink, Stefan Asbury, Herbert Blomstedt, Charles Rosen, Barry Tuckwell and John Williams. 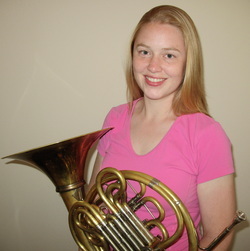 Dr. Gillie studied horn performance with Douglas Hill at the University of Wisconsin-Madison where she received her Masters degree in 2006 and her Doctorate of Musical Arts in 2009. She completed her Bachelors degree at Pacific Lutheran University in 2004 as a horn player in Kathleen Vaught Farner’s studio. A lover of early music, she lectures and performs on natural horn as well as baroque horn. During her time in Madison she appeared in period performances with the Madison Bach Musicians playing repertoire including Bach's Mass in B Minor. Dr. Gillie's doctoral dissertation is entitled "Twentieth and Twenty-First Century Music for Soprano, Horn and Piano: an Original Composition, Professional Recording, and Research of Significant Pieces." Information and recordings are available on her website.